The Chana Masala is such a versatile curry that it compliments almost all the sides served with it. And in our house, it is one of the most popular curries. Why? Because it is one of those tasty Indian recipes that get ready in just 30 minutes. Punjabi Style Chana Masala is a delicious Indian chickpea curry that happens to be vegan and gluten-free. It is just perfect to dip deep-fried bread, rice or even the tandoor-baked parathas. 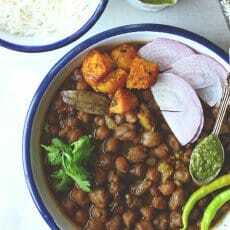 If you will read this Chana Masala recipe, a thought might occur to you – there is a hell lot of spices required. But trust me on this one, all the spices mentioned in the recipe, contribute towards the flavor and texture of the dish. Each ingredient in the list has a crucial role to play and cannot be skipped. 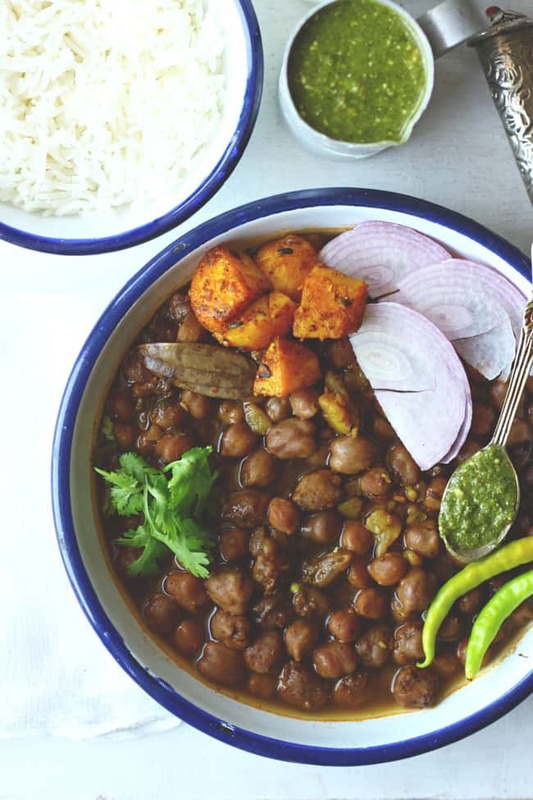 This Chana Masala is packed with flavors and is very close to the street side version of the dish. If you have ever visited the by-lanes of Old Delhi, then you must have tasted thick, luscious chana with bhatura or kulcha. Often served loaded with potato, green chilies, onion and grated radish. Oh god! that combination is totally tantalizing. And often leads you to the stage of food coma. 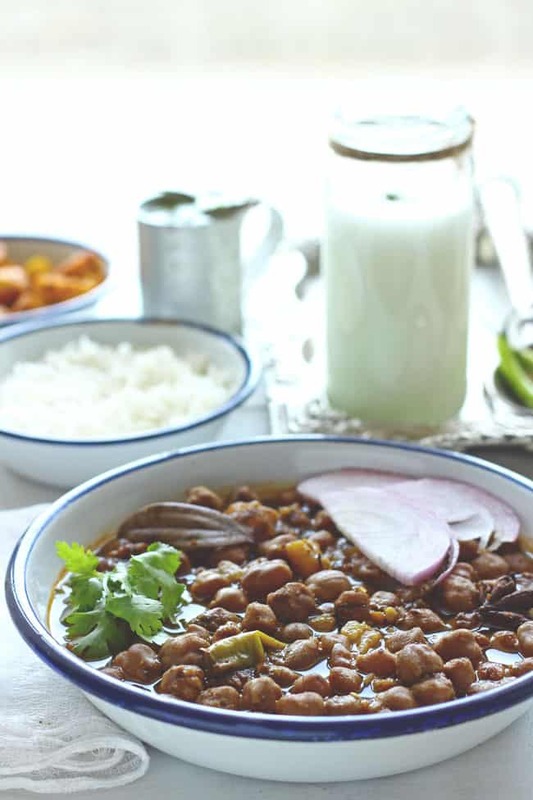 This recipe is my version of Dilli Style Chana Masala. I would not say that my chana masala is better than the one served at the pushcarts around Delhi. 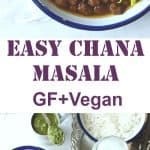 On many occasions, I have cooked them for parties and family get-togethers, and every time won so many compliments for the superb chana masala. For me, the best part about this recipe is there is not much cutting, chopping and advance preparation involved. All you need to have the requisite spices in the pantry. The surprising fact is this Punjabi Chana Masala is a no onion and garlic dish. The flavor profile of the dish is defined by the right combination of spices added while preparing it. How To Perfectly Boil Chickpeas For The Chana Masala? I have used the pressure cooker to perfectly boil the chickpeas for this dish. In case, you are boiling them in a pan add enough salt and a pinch of baking soda. That will surely quicken the boiling process. While boiling chickpeas in a pressure cooker, do not add too much of water. The ideal ratio is 1:2, one cup of chickpeas to two cups of water. We do not need mushy or over-cooked chickpeas to make chana masala. Hence, after 4 – 5 whistles over low heat check the chickpeas for doneness. And at last, don’t forget to add the whole spices while boiling chickpeas. The flavor of the whole spices gives an earthy taste to the chickpeas. To Add/Or Not Tea Leaves In Chana Masala? Many cooks prefer adding tea leaves or tea bags while boiling chickpeas. This is totally optional. Why are tea leaves added? To give a nice dark brown color to the chickpeas for the curry. That is the only reason to add tea leaves. In my recipe, this step is skipped. I believe the true natural color of the dish comes from the spices like anardana (pomegranate seeds powder) and garam masala. But in case, you are keen to get the restaurant like color of the dish, add one tea bag while boiling the chickpeas. Discard the tea bag before adding the chickpeas to the masala. Punjabi Style Chana Masala is a delicious Indian chickpea curry that happens to be vegan and gluten-free. Learn how to make best chana masala without onion or garlic. Clean, wash and soak chana overnight in water or for 5 - 6 hours. Next day drain water, transfer chana in a colander and set aside. Add soaked chickpeas in a pressure cooker with 4 Cups of water. Add whole spices and salt to the pressure cooker. Close the lid of pressure cooker and cook chickpeas until soft. For me, it takes 4 – 5 whistles over a low flame. Allow the steam to release naturally from the pressure cooker. Transfer chickpeas into a large bowl and reserve water in which chickpeas were cooked. Heat heavy bottomed pan over low heat. Add all the spices and asafoetida. Mix nicely and dry roast for 1 minute or till aromatic. Now add kasuri methi to the roasted spices. Fry for 2 - 3 seconds. Add boiled chana and mix nicely. Cook covered for 10 minutes over low heat. After 10 minutes, add ginger, green chili, boiled potato, coriander leaves and 2 cups of reserved water. Stir nicely and allow chana to simmer over low heat to absorb the flavor of spices. Once the Chana Masala starts thickening, taste and adjust the seasoning accordingly. 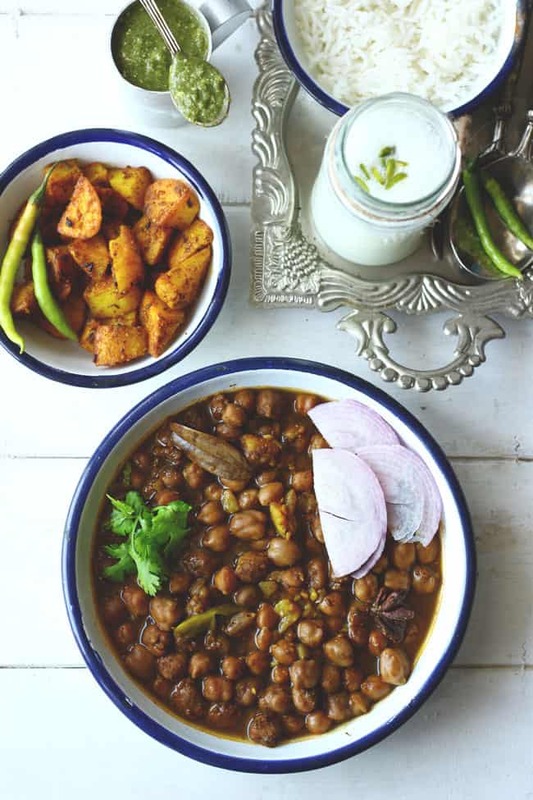 Serve Punjanbi Chana Masala warm with Kulcha ( see recipe ) or Poori ( see recipe ) or bhatura. I love the look of this dish. Your masala is a lot different then what I’ve used in the past so I see a trip to my favorite Indian market is in order to find some new ingredients. Can’t wait to try this. That coaster looks awesome. Great idea to use a slice of a tree trunk. 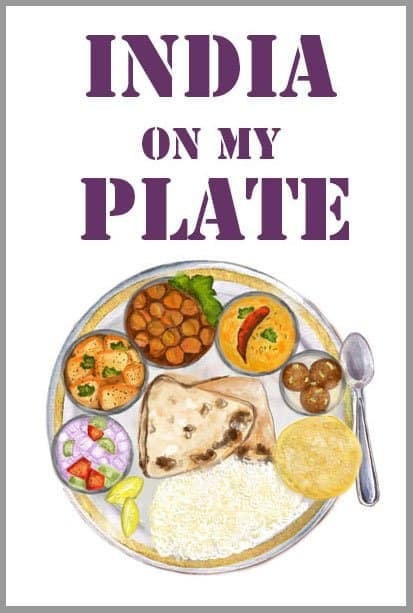 I am a south indian and i tried this way of preparation for the first time. My family loved it, thanks and its fun to see your video recipies- big FAN! I have used a gas stove and on that first whistle comes exactly after a minute or two on a high flame and lasts less than 10 seconds.